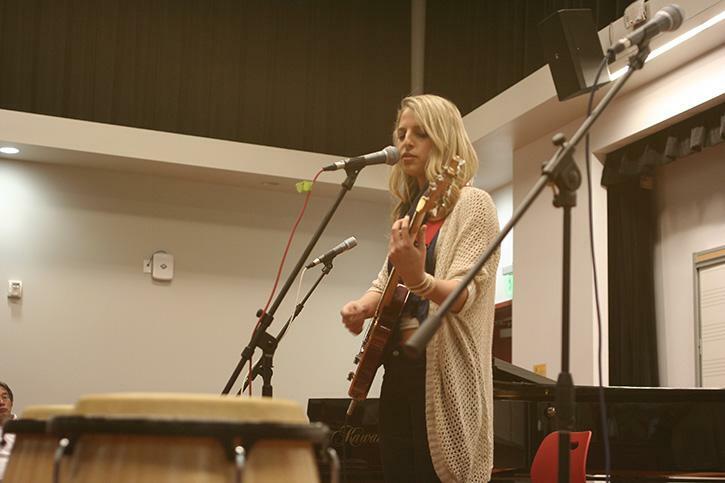 The first edition of the spring Acoustic Café 2014 took place on Feb. 21. The Acoustic Café is a free event, hosted by Professor Eric Chun, founder of the Commercial Music program at American River College. The Acoustic Café is a way for any musician, through a simple audition with Professor Chun, to showcase their talent in a grassroots setting. The atmosphere of the show was very relaxed. Given the small size of Room 547 in the Music Hall, this let spectators be very close to the performers. The room itself had several rows of folding chairs, formed in a semi-circle in front of a white board and a grand piano standing out in the middle of the room. Several amps, drums, guitars and microphone stands are strewn about the low-ground stage for the performers. The Emcees, commercial music business major Eural Strickland and music major Malia Kaye, had great stage presence and did a great job segueing for each act. Kaye also performed solo; two original songs that she sang while playing guitar. Both songs were personal to her, which resonated through her performance. Commercial music major Ron “Dr. Love” Carson, who performed a cover of “Just my Imagination” by the Temptations, finds this environment to be perfect for fostering new, as well as refining existing talent. Carson, who performed with an accompaniment featuring Professor Chun on piano, was very energetic, with even the audience clapping along. This lively act was a great way to close out an overall well-rounded performance. The next Acoustic Café will be taking place on March 7th from 12:30 to 1:30 p.m.
Be the first to comment on "Grassroots commercial music moves audience"